Of the 4 Iberian matches, this is the real home race for Maverick Viñales, Marc Marquez and Dani Pedrosa, who grew up only a few miles from the track. The first stone of the circuit was laid in February 1989 and the track was inaugurated on September 10, 1991, with a car race of the Spanish Tourism Championship. Class 500 took to the track in 1992 and there were 4 editions of the GP Europe. Later the race adopted the current name of Catalan motorcycle Grand Prix. With a length of 4,727 meters, it has 5 curves to the left and 8 to the right and boasts a main straight of 1,047 meters. Given the layout, in the past, the Grand Prix motorcycles have set numerous speed records. From 2017, after modifications to turns 14 and 15, the Grand Prix motorcycles will use the same layout as Formula 1. Except for the long straight, all decelerations are sharp and in rapid succession. The asphalt temperature is particularly high and causes brake cooling problems. Therefore, the work temperatures of carbon discs and pads are rather high during the GP: However, thanks to Brembo’s investment in materials and production processes over the past decade, the braking system is also fully effective at temperatures close to 800 degrees. 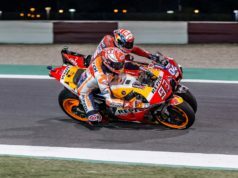 According to Brembo technicians who assist all MotoGP pilots, the Circuit de Barcelona – Catalunya falls into the category of highly challenging circuit for brakes. On a scale of 1 to 5, it earned a difficulty rating of 5, value reached only by the Red Bull Ring of Spielberg, Twin Ring of Motegi and Sepang International Circuit. The other 3 Spanish tracks all ranked lower: a rating of 4 for Jerez and Aragon, 3 for Valencia. 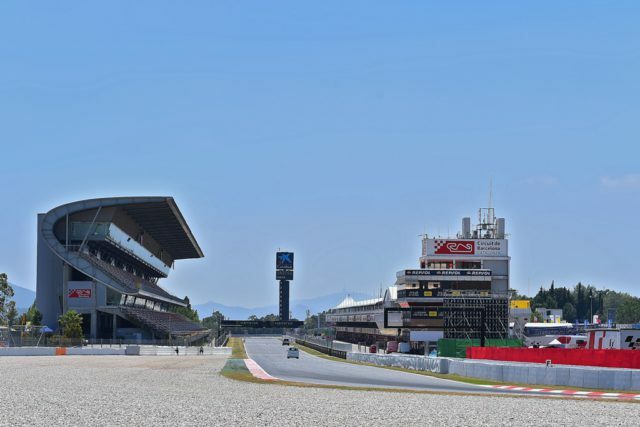 Along with the track of Austin, the Circuit de Barcelona – Catalunya is the only track of the first half of the Championship in which the GP bikes decrease speeds by 200 km/h when braking, twice every lap: in the first turn deceleration is 239 km/h while at turn 10 is it 205 km/h. During each lap, pilots actuate the brakes 10 times for a total of half a minute per lap: even in Misano, which totals 9 brakings per lap, pilots use the brakes 30 seconds per lap. On the Barcelona track, Formula 1 cars use brakes for less than 13 seconds. This means that brakes are used 28% of the time during the Catalan motorcycle Grand Prix and only 16 per cent during the Spanish F1 Grand Prix. This is also due to the 4 brakings in which maximum deceleration is shy of 1 g; average deceleration of the Circuit de Barcelona – Catalunya is around 1.08 g. Only Sepang, Aragon, Jerez and Austin have lower values. 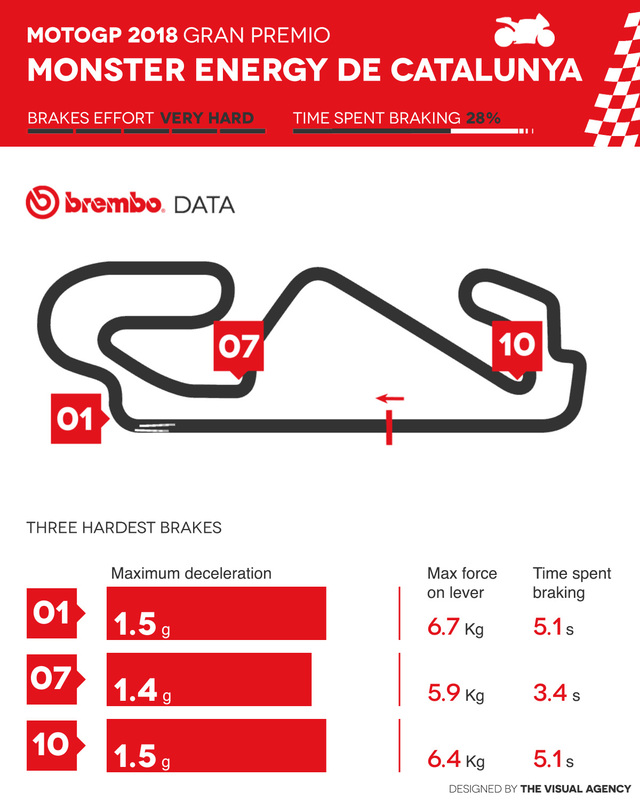 As is fairly obvious, in Barcelona instead Formula 1 deceleration reaches 3.9 g. Summing up all of the force applied by a rider on the Brembo brake lever from the starting line to the checkered flag, the result comes in at more than 1000 kg. At each lap, pilots have to exert a force of 41 kg, which is considerable given the high ambient temperatures in which they race. Of the 10 braking sections at Circuit de Barcelona – Catalunya, 2 are classified as demanding on the brakes. 3 are of medium difficulty. And the remaining 5 pose only a light challenge on the braking systems. Four of the light brakings are towards the end section of the track. The most difficult braking section is at first turn: the GP bikes hit the turn at 340 km/h and enter it at 101 km/h after travelling 285 meters in deceleration. Interestingly, Formula 1 cars reach the braking section at a lower speed, “only” 317 km/h but enter the turn at 156 km/h, a speed obtained after only 43 meters of deceleration. In order to complete the braking section, GP pilots hit the brakes for 5.1 seconds and exert a force of 6,7 kg. on the lever. The 1.5 g of deceleration beats the deceleration of the Alfa Romeo Giulia Quadrifoglio from 200 km/h to 0 km/h by 0.35 g. The pressure of Brembo HTC 64T brake fluid tops at 11,6 bar. The riders also take a taste of 1.5 g in deceleration also at turn 10. Speed plummets from 267 km/h to 62 km/h in 5,1 seconds and 220 meters. At that moment, the force on the lever is 6,4 kg. and the pressure of the brake fluid is 11 bar. Bend 7 is the most demanding turn out of those ranked for average difficulty. GP bikes go from 230 km/h to 104 km/h in a mere 154 meters and 3.4 seconds. The brutality of this deceleration is felt by the 1.4 g experienced by the riders. 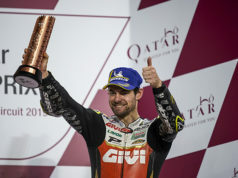 Bikes with Brembo brakes won all 22 editions of the Catalan motorcycle Grand Prix, as also the 4 editions of the Europe GP disputed on this track: 12 victories for Yamaha, 10 for Honda, 3 for Ducati and 1 for Suzuki. Valentino Rossi has claimed a total of 7 500-MotoGP victories, also winning the 250cc 2 times and the 125 once, and always using Brembo braking systems.